Xenopus are aquatic frogs native to sub-Saharan Africa and one of the mainstays of science in understanding disease and healthy development in humans. The frogs became popular in science because from the 1940s to the 1960s they were used worldwide as a pregnancy test. Doctors would ship women’s urine samples to frog laboratories, a sample would be injected into the hind leg of a frog, and if, the next morning, the frog had laid eggs, doctors were 100 per cent confident a woman was pregnant. Research by the University’s Institute of Biomedical and Biomolecular Science has shown it’s possible – and, crucially, simple – to make 32 embryos from one sample of sperm, instead of the current 4-8. By freezing sperm rather than using it fresh, thousands of male frogs will now not need to be humanely killed and the welfare of those used will be improved. Professor of Developmental Genetics at the university Matt Guille led the study, published in the journal Theriogenology. He said: “We’ve made the process very simple so it can be replicated easily, and it’s very effective. Critically, it also greatly enhances animal welfare – hormone levels show frogs are stressed when sent via airfreight around the world, now it seems highly likely that male Xenopus won’t have to be. The University of Portsmouth houses the European Xenopus Resource Centre, the world’s largest Xenopus research facility, and which makes, houses and distributes genetically altered clawed frogs, frog sperm and frog embryos to more than 150 medical research laboratories worldwide. The research team is now refining the process further and testing it by sending samples to laboratories in Japan, the US and in Europe in a project funded by the National Centre for the Replacement, Refinement and Reduction of Animals in Research (NC3Rs). 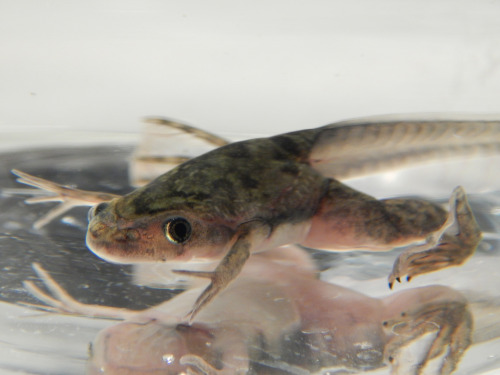 Once feedback has been received and any tweaks made to the method, it will be rolled out across the other Xenopus resource centres in the US and Japan. The advances it has now made are likely to help laboratories worldwide also reduce the number of frogs they use for research. The centre is funded by the Wellcome Trust, BBSRC and NC3Rs and supports researchers using Xenopus. What has been learned at Portsmouth could potentially help develop sperm freezing to support conservation of other frog species.